Beer number 6 in this challenge is from the Westmalle brewery. The abbey was founded in 1794 and became a Trappist abbey in 1836, a year later a small brewery was built inside the abbey walls, and the beers have been extremely popular ever since. This brewery is a bit unusual in that it still uses whole hop cones in it's brewing. There are 3 beers produced at the abbey of which only the dubbel and tripel are available for public consumption. Today I will be sampling the dubbel, which has been brewed to the same recipe since the 1920's. 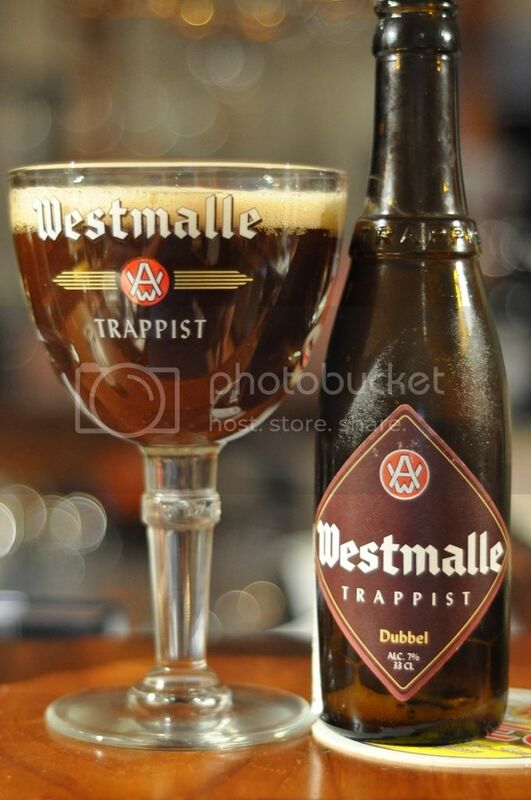 Westmalle is considered one of the most influential breweries of recent times and former head-brewer, Brother Thomas, was the technical advisor for the setup of the Achel Brewery in 1998. That's enough history, it's time for some drinking. The beer pours a chestnut brown colour with a quickly dissipating tan head. The head laces the glass really nicely considering how quickly the head falls to a thick ring, however this ring sticks around for the duration of drinking. When held to the light this beer has a strange slightly orange tint to it, I believe this is caused by the Westmalle malts, but I'm unsure. It's a nice looking trappist beer. For once I am slightly thrown by the smell of this beer. It's one of the times where I know I've tasted something similar before but can't quite place it. There are the usual roasted caramel malts, dark fruity undertones as well as some apple and a spicy hint at the end. But despite being able to identify those elements I know, there's something else in there and it's bugging me a little that I can't work it out. The beer smells incredibly complex and it's lovely, I can't wait to taste this! Whatever that smell is, this beer tastes fantastic! The flavours are strong and along the same lines as the aroma suggested. The caramel malts are of an extremely high quality and really make this beer. The beer retains a fruity character, with elements of figs and other dark fruits. There is also apple and I think pear present before some nutmeg/cinnamon spicyness gives the beer a lovely warm finish. Like all trappist beers, you can see the care that has gone into making this beer. The quality of the ingredients used is incredibly high. The mouthfeel is not too heavy and has enough carbonation to make the beer work, as alcohol is present in the taste but it seems to fit quite well. It's a seriously high quality beer and I would suggest that this would be an excellent introductory trappist beer, for those looking to try one. Remember to serve this at about 8-10 degrees to really help bring out the flavours.